Finally I dressed both my dummies with kimono. 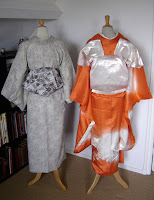 Because I have just one accessoires-set, I dressed one of my dummies with my wintery komon and hanhaba obi, and one with my pretty orange furisode. For the komon I tied the obi with a clamshell musubi, but when I already dressed them I found some other musubi for hanhaba obi on the IG-forums. Maybe I will try one these musubi later this week. We have a party later this week, and one of our friends gave me the second dummy, that's why I dressed them. A personal kimono dresser would indeed be nice! A much easier way to tie the otaiko is to tie it on your belly and in the end turn it on to your back. I did that a couple of times and it really is easier. Now I want to try and tie it on my back because when you tie it on your belly and then turn it over, your kimono can shift a little. O, and I'm honored to have a link on your blog! Muchos gracias from Holland! i have tried sometimes to tie the otaiko in my front, but as you say when i turn it back, the kimono shifts and i get frustraded!>_< Specially when i have done a great work with my kimono...U_U I'm glad to have connection with nice people who have similar interests like me. Where are you from holland? my family have friends there, well they are more like family. ^_^see you! Haha, the frustration sound familiar! I guess it will be more practice for both of us ^_^. I live in a little village called Kaatsheuvel, but maybe your friends, or even you, know the themepark Efteling, with all the fairytails? I live in the same village as where that parc is situated.